1871 Birth: Ioannis Metaxas: Greek general and the Prime Minister of Greece during the 4th of August Regime, from 1936 until his death in 1941. In foreign policy Metaxas had a clear pro-British stance. He saw in the Mediterranean the British as a natural ally and their fleet was a major force while the expansionist goals of Mussolini were clearly threatening to Greece. The policy of Metaxas to keep Greece out of World War II was decisively broken by the blunt demands of Mussolini in October 1940, who demanded occupation rights to strategic Greek sites and was met with a curt reply by Metaxas "Alors, c'est la guerre" ("then it is war"), which was encapsulated in Greek popular feeling in the single word "No". Italy invaded Greece from Albania on October 28. Thanks to preparations and an inspired defence the Greeks were able to mount a successful defense and counter offensive, forcing the Italians back into Albania and occupying large parts of Northern Epirus (Southern Albania). Metaxas died in Athens on January 29 of a phlegmon of the pharynx which subsequently led to uncurable toxaemia. At the time it was speculated that he was poisoned by the British. He was succeeded by Alexandros Korizis. After Metaxas' death, the Germans had a hard time facing the fortifications constructed by Metaxas in Northern Greece, which were called the Metaxas Line. To this day, Metaxas remains a highly controversial figure in Greek history. He is reviled by some for his dictatorial state, and admired by others for his popular policies, patriotism, defence to aggression, and his military victory against Italy. I am in the happy position of being, I think, the first British Minister of the Crown who, speaking on behalf of the people of this country, can salute the American Nation as comrades in arms. I am glad; I am proud. I am glad not merely because of the stupendous resources which this great nation will bring to the succour of the alliance, but I rejoice as a democrat that the advent of the United States into this war gives the final stamp and seal to the character of the conflict as a struggle against military autocracy throughout the world. That was the note that ran through the great deliverance of President Wilson. It was echoed, Sir, in your resounding words today. The United States of America have the noble tradition, never broken, of having never engaged in war except for liberty. General Haig—after announcing "Our backs are to the wall"—forbids further retreat and galvanizes British resistance at Lys. 1922 Weimar: Adolf Hitler gives an early speech in Munich, well received by the faithful, but completely ignored by the press. Hitler has yet to get any press coverage to speak of. The speech mainly deals with the strengthening of the movement. And when I look on my people I see it work and work and toil and labor, and at the end of the week it has only for its wage wretchedness and misery. When I go out in the morning and see these men standing in their queues and look into their pinched faces, then I believe I would be no Christian, but a very devil, if I felt no pity for them, if I did not, as did our Lord two thousand years ago, turn against those by whom today this poor people is plundered and exploited. 1924 Birth: Peter Safar: Austrian-American physician whose pioneering "Kiss of Life" procedure of mouth-to-mouth resuscitations is credited with saving countless lives. In the 1960's the technique was combined with new chest compressions, producing what's known today as CPR, or cardio-pulmonary resuscitation. He also helped create the organization that, in 1976, became the World Association for disaster and Emergency Medicine. Although there are ancient references to the apparent use of mouth-to-mouth resuscitation in the Bible, the technique fell out of practice until rediscovered by Safar in the 1950s. Also credited with playing a key role was his colleague, Dr James Elam. 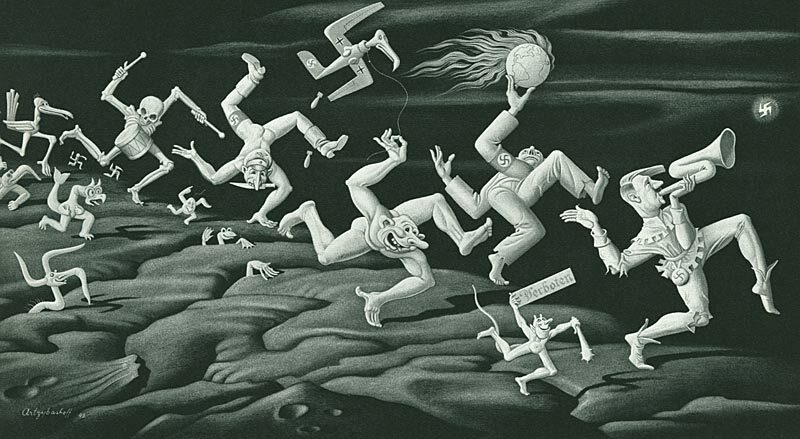 Safar survived a Nazi labor camp before emigrating to the US after World War II. 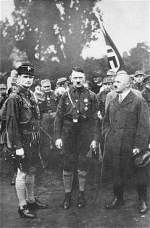 1934 Julius Streicher is appointed Gauleiter of the German state of Franconia. 1937 Aviation: Sir Frank Whittle ground-tests the first jet engine designed to power an aircraft, at the British Thomson-Houston factory in Rugby, England. Due to funding and manufacturing problems, Hans von Ohain of Germany was able to beat him to production models, but Whittle's work and tireless efforts to produce his designs given official lack of interest are legendary. By the end of the war, Whittle's efforts and Britain's superior high-temperature alloys resulted in engines that led the world in performance for the next decade. 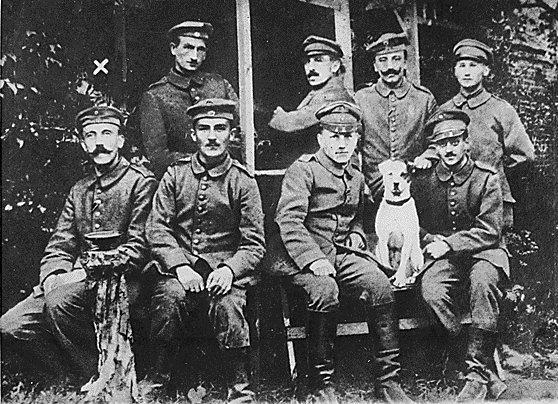 Under pressure from the Reich, it had now been decreed that, since sufficient labor did not present itself voluntarily for service in the German Reich, compulsion could be used. This compulsion meant the possibility of arresting male and female Poles. A certain amount of unrest had been caused by this, which, according to some reports, had spread very widely and which could lead to difficulties in all spheres. Field Marshal Goering had once pointed out, in his big speech, the necessity for sending a million workers to the Reich. One hundred and sixty thousand had been delivered to date . . . . To arrest young Poles as they left church or the cinema would lead to ever-increasing nervousness among the Poles. Fundamentally Frank had no objections to removing people capable of work who were lounging about in the streets. But the best way would be to organize a round-up, and one was absolutely justified in stopping a Pole in the street and asking him what work he did, where he was employed, et cetera. The German Reich Plenipotentiary has received instructions to demand from the Royal Government of Denmark: First: A formal declaration as to whether His Majesty, the King of Denmark, to whom M. De Kauffmann, Minister of Denmark now refers, or any other member of the Royal Danish Government had, prior to its publication, any knowledge of the treaty concluded between M. De Kauffmann and the American Government. Second: The immediate putting into effect of the recall of M. De Kauffmann, Minister of Denmark, by His Majesty, the King of Denmark. Third: The delivery without delay to the American Charge d'Affaires in Copenhagen of a note disavowing M. De Kauffmann, communicating the fact that he is being recalled, and stating that the treaty thus concluded is not binding upon the Danish Government, and formulating the most energetic protest against the American, procedure. Fourth: A communication to be published in the press, according to which the Danish Royal Government clearly states that M. De Kauffmann acted against the will of His Majesty, the King, and of the Danish Royal Government and without their authorization; that he has been recalled, and that the Danish Government considers the treaty thus concluded as not binding upon it and has formulated the most energetic protests against the American procedure. Fifth: The promulgation of a law according to which the loss of nationality and the confiscation of property may be pronounced against any Danish subject who has been guilty of grave offenses abroad against the interests of Denmark, or against the provisions laid down by the Danish Government. Sixth: M. De Kauffmann is to be brought to trial for the crime of high treason, by virtue of Article 98 of the penal code, and of Article 3, Section 3, of the law of 18 January 1941, and to lose his nationality in conformity with a law to be promulgated, as mentioned under Paragraph 5. It is unfortunate that geographical distance makes it practically impossible for you and me to meet at this time. Such a meeting of minds in personal conversation would be useful to the conduct of the war against Hitlerism . . . . I have in mind a very important military proposal involving the utilization of our armed forces in a manner to relieve your critical Western Front. This objective carries great weight with me. Therefore, I wish you would consider sending Mr. Molotov and a General upon whom you rely to Washington in the immediate future . . . . The American people are thrilled by the magnificent fighting of your armed forces and we want to help you in the destruction of Hitler's armies and material more than we are doing now. 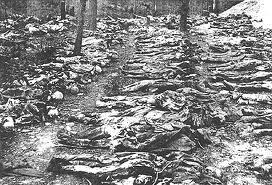 1943 World War II: Katyn: The Nazis, familiar enough with atrocities to know one when they come across one, announce the discovery of a group of mass graves in the Katyn Forest containing the bodies of 4,100 Polish officers, murdered by the Soviets. 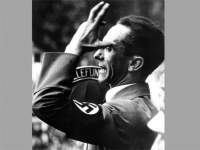 1944 Death: Adolf Wagner: NSDAP member from 1923. Nazi party provincial chief of Munich and Upper Bavaria. 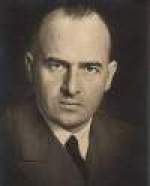 Bavarian interior minister after 1933. His state funeral is notable for the fact that it is the last time the Blutfahne is seen in public. 1944 World War II: Italy: King Victor Emmanuel announces his intention to abdicate in favor of the Prince of Piedmont when the Allies enter Rome. Oberlangen Stalag: The Ist Polish Armored Division liberates 1,728 female AK members. Thank you for your frank explanation of the Soviet point of view of the Berne incident, which now appears to have faded into the past without having accomplished any useful purpose. There must not, in any event, be mutual distrust, and minor misunderstandings of this character should not arise in the future. I feel sure that when our armies make contact in Germany and join in a fully coordinated offensive the Nazi armies will disintegrate. I would minimize the general Soviet problem as much as possible, because these problems, in one form or another, seem to arise every day, and most of them straighten out, as in the case of the Berne meeting. We must be firm however, and our course thus far is correct. Note: The wartime communications presented here are dated the day they were received, not the often different day sent. 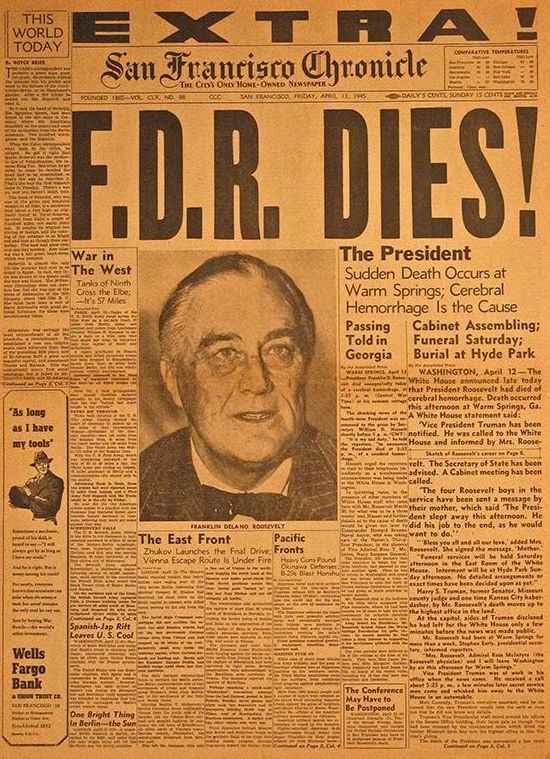 U.S. President Franklin Delano Roosevelt dies of a cerebral hemorrhage in his home at Warm Springs, Georgia, on this day in 1945. The only man to be elected to four terms as president of the United States, Roosevelt is remembered—by friends and enemies alike—for his New Deal social policies and his leadership during wartime. Roosevelt was elected to a third term in 1940 with the promise of maintaining American neutrality as far as foreign wars were concerned: "Let no man or woman thoughtlessly or falsely talk of American people sending its armies to European fields." 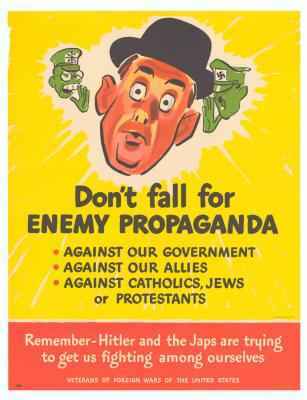 But as Hitler's war spread, and the desperation of Britain grew, the president fought for passage in Congress of the Lend-Lease Act, in March 1941,which committed financial aid to Great Britain and other allies. In August, Roosevelt met with British Prime Minister Winston Churchill to proclaim the Atlantic Charter, which would become the basis of the United Nations; they also drafted a statement to the effect that the United States "would be compelled to take countermeasures" should Japan further encroach in the southwest Pacific. Despite ongoing negotiations with Japan, that "further encroachment" took the form of the Japanese bombing of Pearl Harbor, "—a day that would live in infamy." The next day Roosevelt requested, and received, a declaration of war against Japan. On December 11, Germany and Italy declared war on the United States. Then came a call from Washington with the news from Warm Springs. 'I felt as if I had been struck a physical blow,' Churchill recalled. The long courtship, with its joys and frustrations, had come to an end. 'I have just heard the grievous news of President Roosevelt's death,' he added to the cable to Clementine. He had been writing to Mary, too, who had just been decorated for her service in antiaircraft batteries in northwest Europe. Telling her the news in a postscript, Churchill noted: 'You know how this will hit me.' It was late, too late to do much, but Churchill discharged his duties. 'Get me the palace,' he said to an aide, and Churchill briefed the king's private secretary, who told George 6th. In the night, Churchill cabled Lord Halifax in Washington to ask if he might come to the funeral. As Truman later told his daughter, 'He never did talk to me confidentially about the war, or about foreign affairs or what he had in mind for peace after the war.' 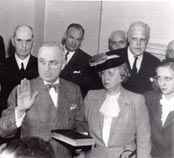 Incredibly, Truman never even met the secretary of state, Edward R. Stettinius, Jr. . . . . A single episode at the end of his first cabinet meeting reveals how poorly informed Truman actually had been during his apprenticeship. As cabinet members filed out, Secretary of War Henry Stimson moved to the chair next to Truman's. When they were alone, Stimson confided that the government had been working secretly on an explosive of 'exceptional force' that no one in Congress knew about. That is all that the man Franklin Roosevelt had appointed to the cabinet felt free to tell the president of the United States at that time. Truman did not even grasp that Stimson was talking about the atomic bomb. On the following day the president learned a bit more, but nearly two weeks would go by before Stimson spelled out in detail what was happening, and Truman still appears to have been kept in ignorance of the meaning of the phrase 'Manhattan Project' more than a month after he succeeded FDR. Colonel Amen: Is it not a fact that you are simply lying about your signature on this letter, in the same way that you are lying to this Tribunal about almost everything else you have given testimony about? Is not that a fact? Kaltenbrunner: Mr. Prosecutor, for a whole year I have had to submit to this insult of being called a liar. For a whole year I have been interrogated hundreds of times both here and in London, and I have been insulted in this way and even much worse. My mother, who died in 1943, was called a whore, and many other similar things were hurled at me. This term is not new to me but I should like to state that in a matter of this kind I certainly would not tell an untruth, when I claim to be believed by this Tribunal in far more important matters. Colonel Amen: I am suggesting, Defendant, that when your testimony is so directly contrary to that of 20 or 30 other witnesses and even more documents, it is almost an incredible thing you should be telling the truth and that every witness and every document should be false. Do you not agree to that proposition? This morning the Kaltenbrunner case continued with K(altenbrunner) on direct examination by his own lawyer. He is a crummy-looking creature, really an evil-looking man. He was Himmler's chief assistant and he participated in all of the horrible crimes that were committed—we have witnesses who saw him watching the operation of the gas chambers where all the unfortunates were executed by the thousands. He had the various types of executions put on as a demonstration for him: shooting, hanging and gassing. Three human beings were used to show him how it worked. Please Note: The list-owner and the moderator of 3rdReichStudies are not responsible for, and do not necessarily approve of, the random ads placed on our pages by our web server. They are the unfortunate price one pays for a 'free' website.